Yes, there’s a lingo that is understood among designers that may sound foreign to an outsider: don’t be an outsider. Catch up on the language of your talent and be on the same page as them. Trust me, they will appreciate you for it. 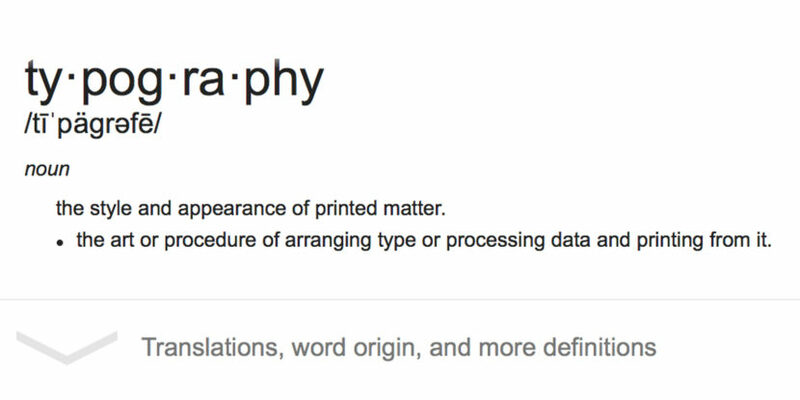 In this article you will learn about some basic typeface and typography terms which pertain to the industries where you would see designers in printing, advertising, and marketing. Take some time to learn the commonly used terms. Copy is the body of text that will be displayed in all of the advertisement or signage. Some marketing teams will have a copy editor, which is a crucial role to be sure the correct punctuation and sentence structure is considered before approval of designs or material are considered. In typography, there are a few terms to describe the relationship between letters and words. Kerning is the spatial balance between each letter in a space, usually referring to the letters in a word. Another term within the typography realm of designing, is leading. This is the relationship between vertical positioning of a paragraph within the bottom of one line to the top of the line underneath. Lower case letters have a common height, which is called an x-height. Any part of a letter that is above the x-height is called an ascender. In the opposite case of letters above the x-height, there are lower case letters that fall below the baseline. These descenders are commonly the same in most fonts. However, fancy script fonts may include descender and ascender portions of the font. An example of a serif font is the glorious Times Roman typeface. Any decorative stroke at the corner or end of a letter is called a serif. It is most commonly used for small text and books because of it’s legibility and flow while reading. This is a typeface without any decorative elements, which looks more modern and cleaner than text commonly used in novel printing. The most popular style of script fonts appears like handwriting or the use of organic shapes instead of a linear straight display of characters. Looking for something bold? This is a font style that will surely fit your need! Slab fonts are thicker, bolder, and commonly used in headlines or titles for a strong statement. If I didn’t cover something that you think is important to discuss, then please write it in the comments below! Thank you so much for reading! I hope this article helps with explaining a few things for designers and team members that work with designers.